Hello everyone! 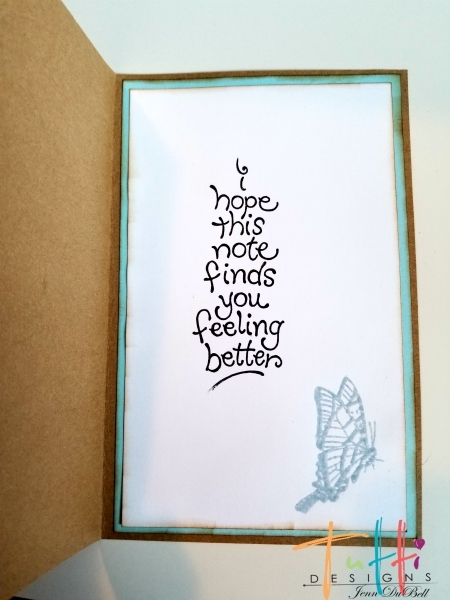 Jenn here today sharing a card I created as a get well wish for a friend recovering. She is a very strong woman and I thought this was the perfect quote! 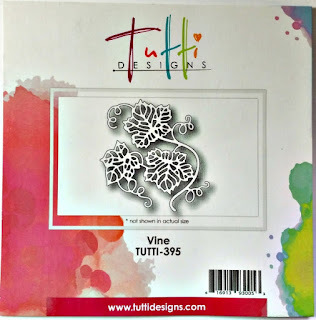 I have used several of the amazing Tutti Designs Dies! The butterflies, ivy, and floral orchestra were snipped after die cutting them. This is a fun way to add texture to a project. I used some pretty, glitter embellished paper layered with white cardstock underneath. The pieces were tattered with a tool and inked on the edges using Distress ink and then adhered to a card cut from Kraft cardstock. The card measures 4 1/2" X 7". To create, cut Kraft cardstock to 9" X 7" and fold down the middle and burnish flat. Layer white cardstock 4 1/4" X 6 3/4" with the designer paper 4" X 6 1/2" on top and adhere to the card front. 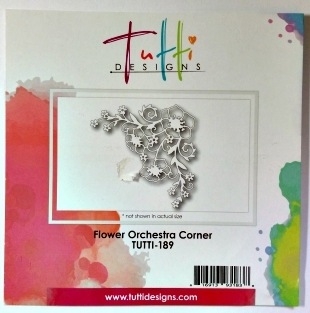 Next do the inside of the card before adding any dimensional embellishment to the front so it does not get mashed down. Again the edges of the paper are inked using Distress Ink. First adhere blue cardstock 4 1/4" X 6 3/4" and white cardstock 4" X 6 1/2" on top of that. I have added a small butterfly that coordinates with my theme. 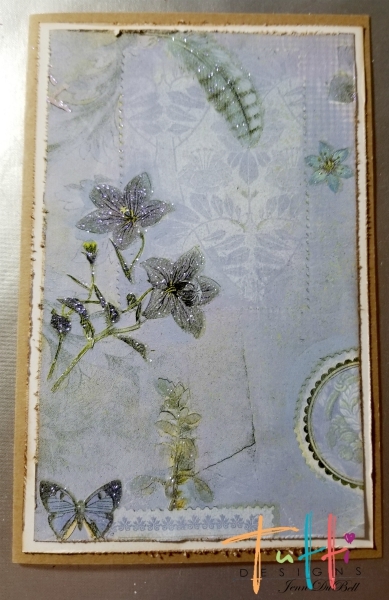 I stamped it with embossing ink and embossed with an irridescent powder from Lindy's. For the front of my card I used the cross stitched nesting oval dies in the two largest sizes. I cut one in white and the smaller in blue. The white oval is adhered to the front. 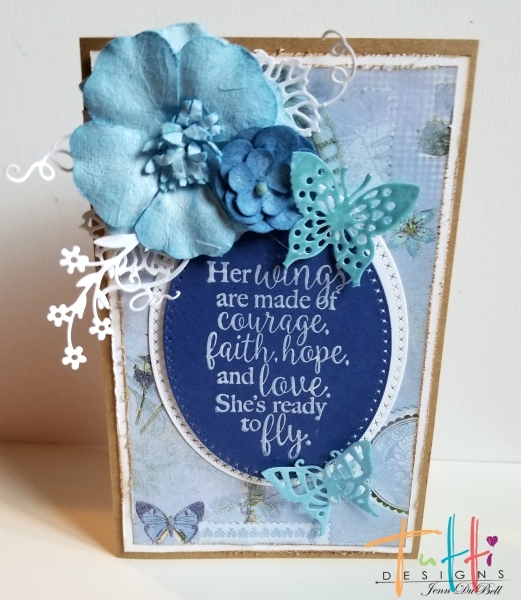 A sentiment was stamped and embossed in white onto the blue oval and layered on the white oval using foam adhesive squares to raise it up. 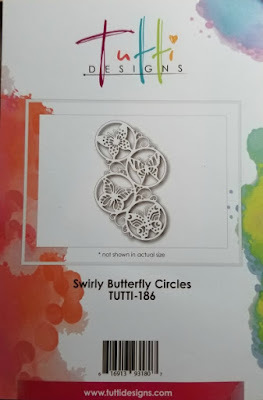 I cut two butterflies out of the die cut and embossed them in irridescent powder. I added a couple blue flowers and the snipped Ivy and orchestra corner bits. This was such a fun card! I hope that you like it as well! Absolutely Gorgeous Card!! Love those delicate die cuts! OH WOW I'm so sorry I'm late in seeing and commenting on your card Jenn! 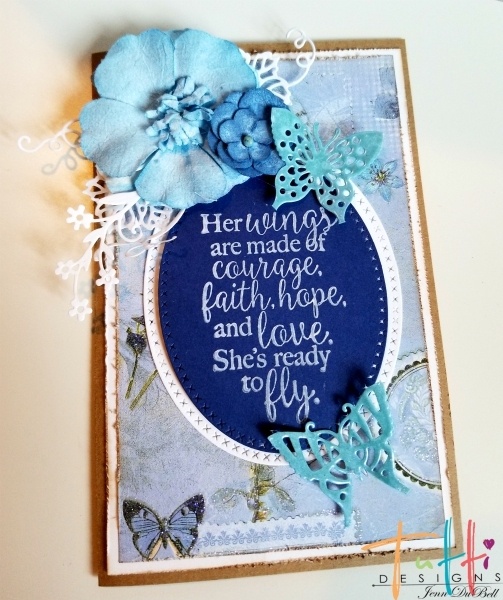 This is GORGEOUS and I love how you've used these dies! Just Beautiful!